With the long weekend upon us and no travel plans, I'm contemplating how to balance work and play. This is a constant debate when you're self-employed. 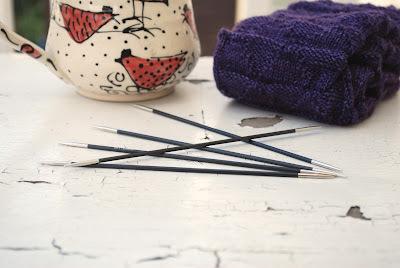 I envision a weekend full of luxurious hours of uninterrupted knitting time. To be fair, most of my knitting is work-related, but often it never seems like work. Unless I'm coming up on deadline . . . which I am. In an effort to be balanced, this weekend will include time for work, and I will make time for other things. My teenage daughter is anxious to get behind the sewing machine. I'd better strike while I have the opportunity. By next week the novelty of sewing will have passed, and she'll have moved on to something else. There are new colors to name. Yes, I know. Someone already pointed out that they look like Neapolitan ice cream. Now I need stand alone names. 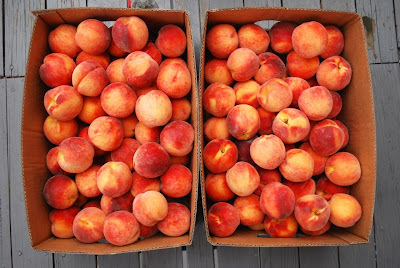 There are peaches to process. These two boxes plus one more. Plenty for pie and cobbler and jam and . . .
Best to get on with it. I'll be doing a balancing act and savoring this last bit of summer. I hope you do too. This week's color inspiration comes from the dahlia my husband has been tending. Actually he left it in my care, but it wasn't thriving. 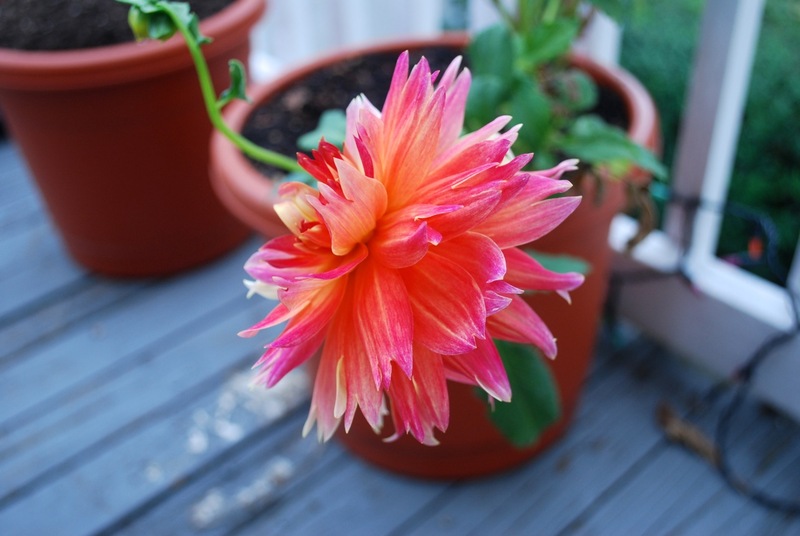 He rescued the poor plant just in time, and now it's looking lovely. I've added another pair to my Summer of Socks collection. Caterpillar Sock. I always enjoy Anne Hanson's patterns, and this one was no exception. 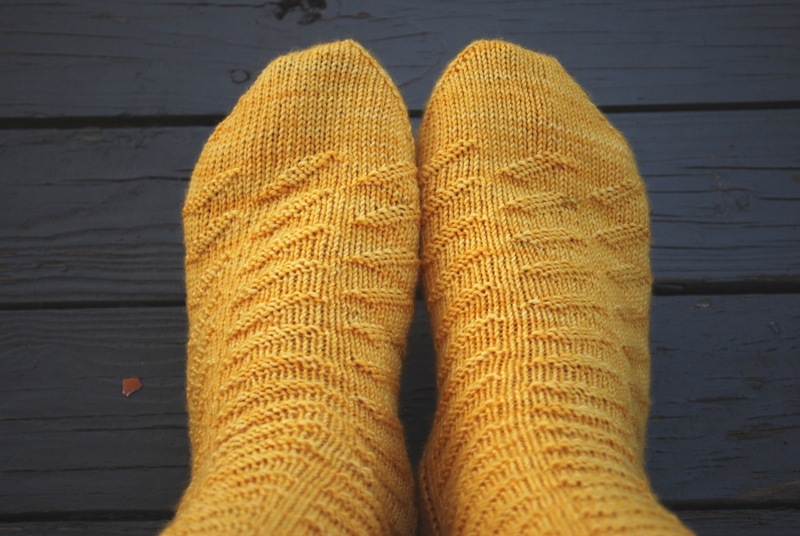 With little purl bumps making their way around and around, these socks knit up in no time. The yarn is Dirty Water DyeWorks Lillian, colorway No. 2 Pencil. All the back to school ads must be wearing on me. This colorway isn't on the website yet, but a photo shoot is on my to-do list. No. 2 Pencil will be making the rounds this fall. And now I'm off to dig up another sock pattern. I still have a couple weeks before summer officially ends - just enough time to squeeze out another pair. One of my weekend goals was to pick a lingering knitting project and set it free. I chose my target and assessed the situation. 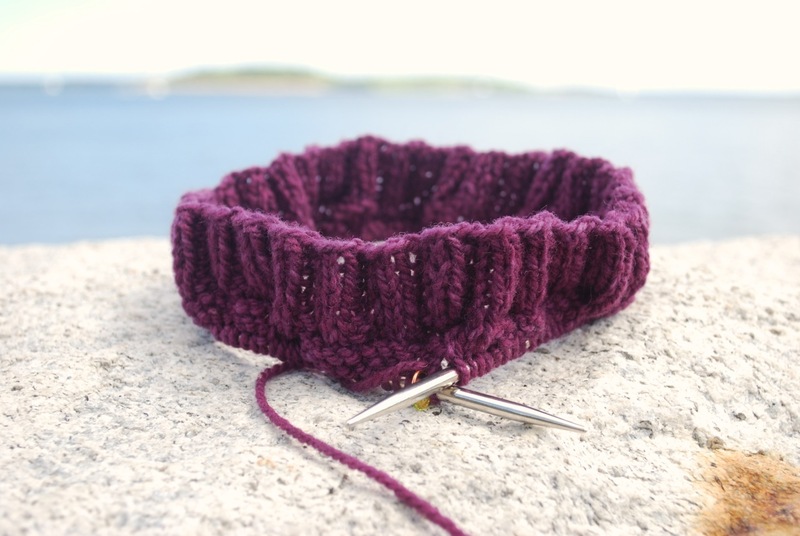 I looked at what had been knit and consulted the pattern. 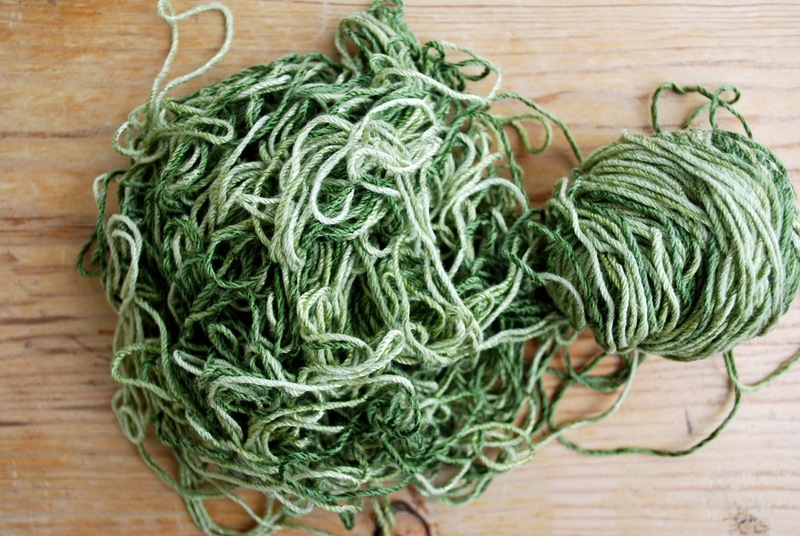 There wasn't that much left to knit. I could finish this up and maybe tackle another project before Monday rolled around. I did finish but not with much weekend time left to spare. I blame it all on a couple of time-consuming interruptions and a math mistake. Apparently my calculations were off, and a 24-row repeat didn't yield the number of inches I thought it did. Never mind. I didn't let a minor math error get in the way of forward progress. I'm thrilled with the results. 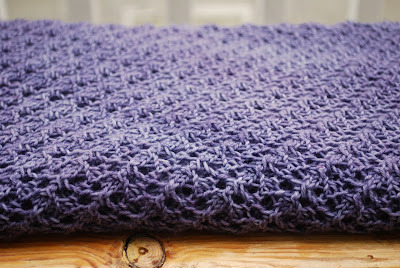 This design is worked on the bias and creates a cozy, cushy fabric. 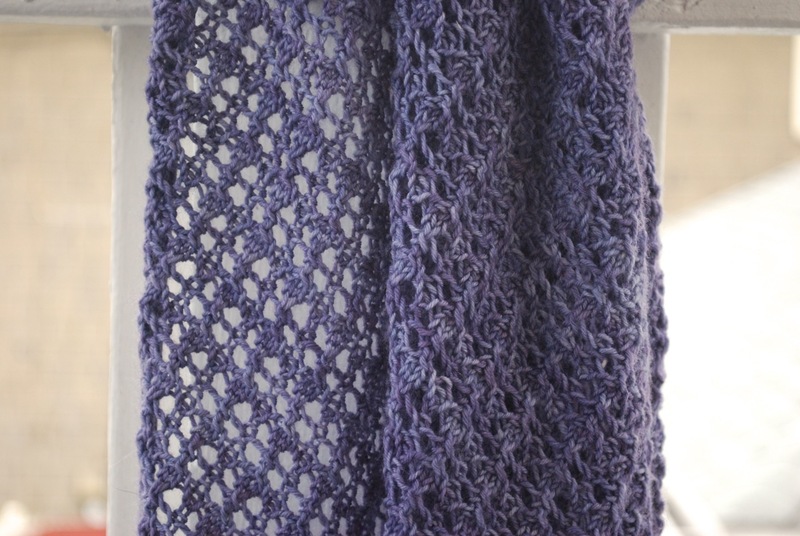 With lace on one side and textured ribbing on the other, this shawl can be worn on either side. The I-cord edges are knit-as-you-go and make a nice finished edge. 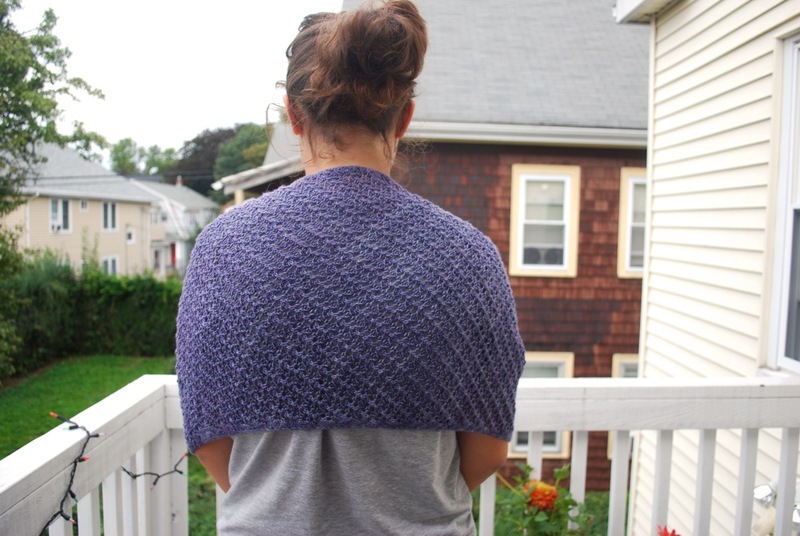 Massey is a substantial shawl, but the pattern can easily be adapted to make it smaller. 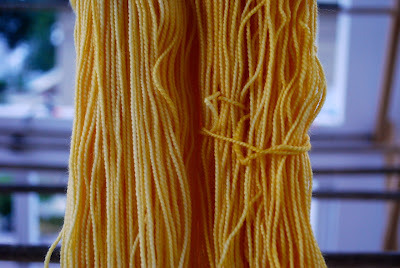 The yarn is Dirty Water DyeWorks Lucia, colorway Lupine. Ready to be packed away for fall travels. While I've been enjoying the relaxed pace of summer, I realize it's drawing to a close. To help with the transition from lazy days to fast and furious, I updated my list of fall events. It's easier to come up with a plan when I can clearly see the train that's headed in my direction. You can see the complete train wreck list on the right sidebar and on the Events page. It's shaping up to be a whirlwind fall. A couple of highlights . 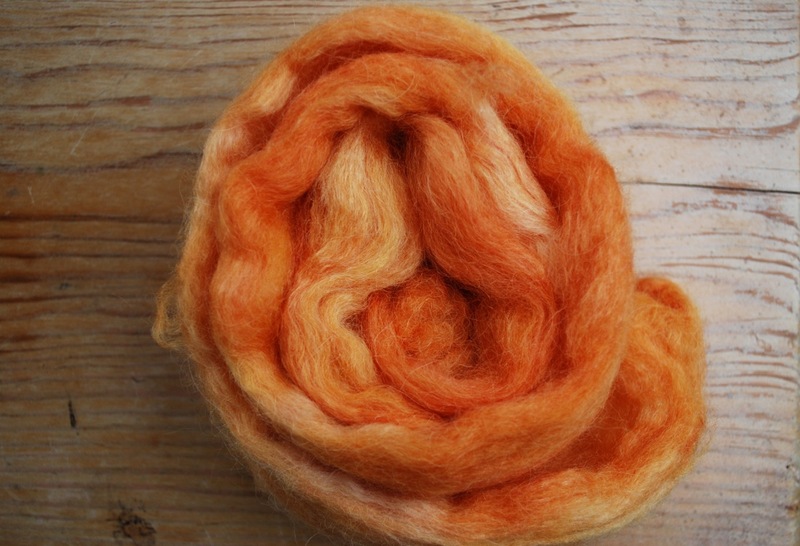 . . on September 14 I'll be at KnitWit Yarn in Portland for a yarn tasting. We had a similar get together in March. Since we had so much fun, we decided to do a repeat. Suzie, the shop owner, is friendly, encouraging and enthusiastic. I'm looking forward to visiting the Portland-area knitters again. 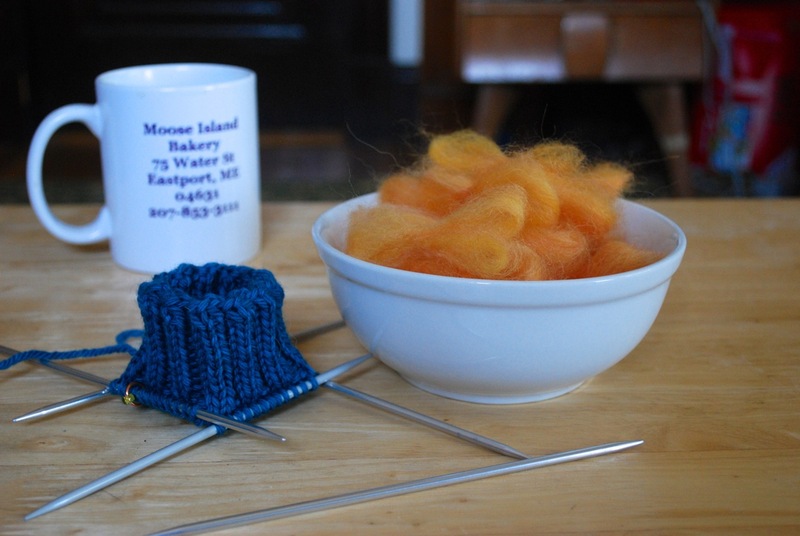 At the end of September, I'll be at KnitEast in New Brunswick, Canada. This event has a full lineup of interesting classes, and there are still several openings. It promises to be a stimulating fiber weekend. 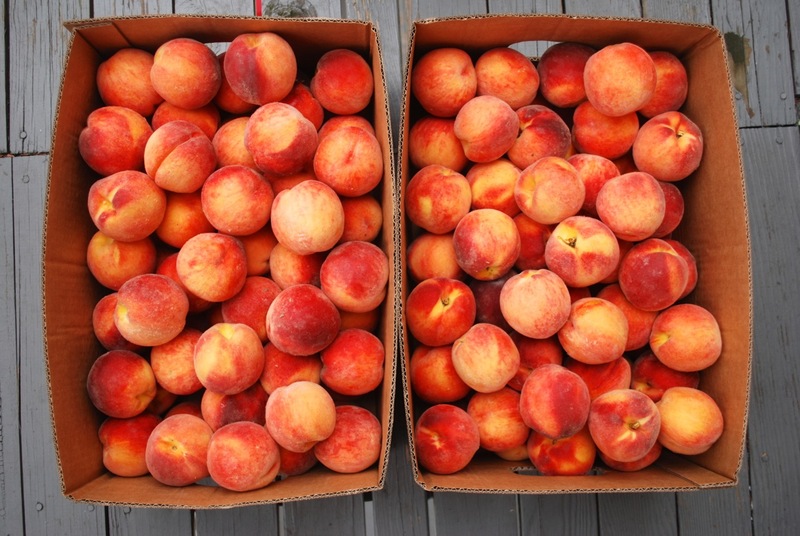 If you're within striking distance of New Brunswick, consider taking advantage of this event. The scenery alone is worth the trip. Just to clarify . . . yes, I do have two events listed for the last weekend in September. And yes, I may have taken leave of my senses. While I'm across the border, I'll have another booth up and running at Vermont Sheep and Wool. Don't burst my bubble. I've convinced myself this will be double the fun and not double the work. And now I'm off to finish what I started yesterday. I had bonus social knitting time, and this sock went from cuff to heel flap. Now I feel compelled to turn it and work the foot. I'll ponder my fall strategy while I knit. I have the farmers' market to thank for my color inspiration this week. We're in the thick of it now with more and more goodies each and every week. 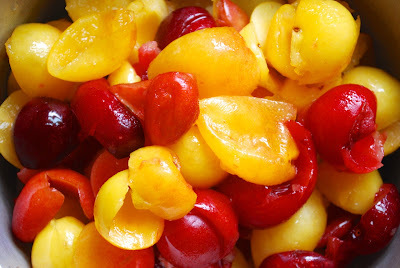 Plums . 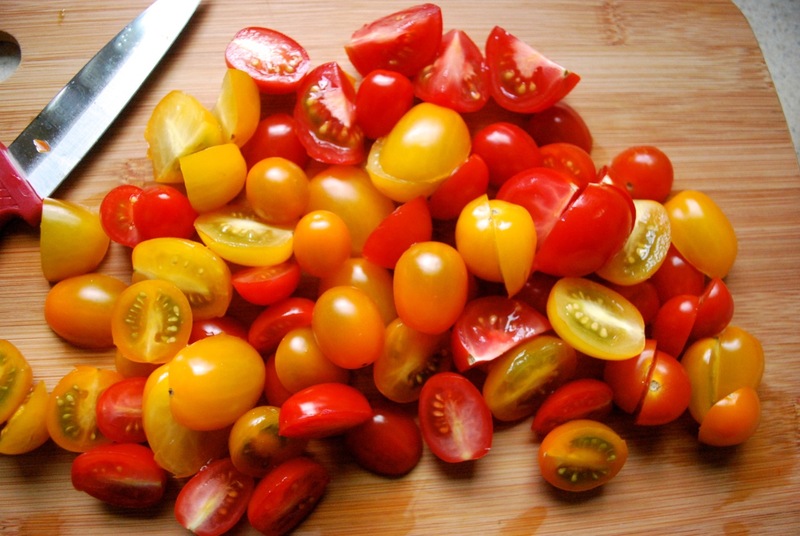 . . ready for sauce. In case you're wondering, it's gingered plum sauce. It tastes as good as it sounds, and it's easy to make. Follow the link and scroll down for details. The other day I started to feel a twinge of panic. I have a list of new fall samples that have to be knit, and they're not getting checked off quickly enough. Then yesterday someone was cruel enough to point out that it's only two months until Rhinebeck. Two months. And I have other events before Rhinebeck, which means I have less than two months to pull everything together. This could have thrown me into a full-blown tizzy, but instead I sat down, took a deep breath and cast on. Starting a new project is a wonderful coping mechanism, and it's productive. Something short and sweet . . . just enough to take the edge off. Last spring it became apparent that I needed to do a major overhaul of my office and work space. Winding was inefficient, yarn was getting buried, labels were scattered and the tape dispenser was always missing. I put the task of reorganizing the space on my summer projects list. Last week, when I realized I was running out of summer, I took the plunge. I cleaned, moved furniture, rearranged and cleaned some more. It was a good exercise in making the most efficient use of space. It reminds me of putting together the pieces of a jigsaw puzzle. Sometimes you have to try a couple different ways before it all works. With any project like this, there are always unexpected discoveries along the way. I found a dead mouse behind one large chest. I'm glad it was dead, but even then it gave me a good scare. I found a pair of glasses that had been missing for months. 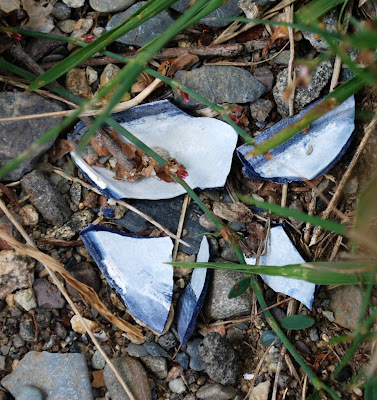 I was sure I had lost them this spring on a trip to Maine. As for one of my favorite earrings that went AWOL, it hasn't surfaced. I still have to clean my desk, so there's hope. 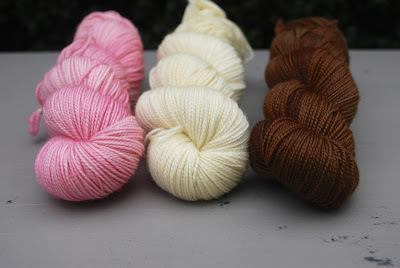 I gathered together many of the sample colors I've worked on over the last few weeks. Group photo. I'll be using some of these this fall. Several months ago a friend gave me custody of this mess - she knows I'm always up for a good challenge. I had completely forgotten about it until I stumbled across a nondescript bag while I was sifting and sorting. I'm not sure about the blend, but I think silk is involved. This project has taken on new meaning. And in the sewing department . 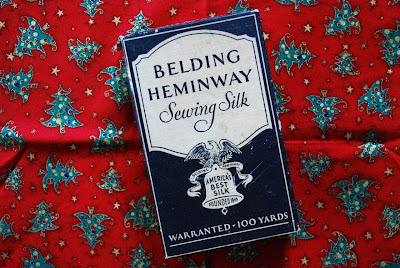 . .
Holiday fabric and a box of vintage sewing silk. I can't bear to use the thread, but there's enough fabric for a cute project bag. With any luck I'll have enough summer left to do some sewing. Right now, I'm off to clean my desk and find that missing earring. I haven't had much downtime this summer, let alone vacation time. My kids have been doing all the traveling, and I've had to live through their adventures. My solution in situations like this is to take getaway time - a day off here and there whenever I can squeeze it into the schedule. Yesterday I had a small window of opportunity for escape - not the whole day, just a few hours. I put in some concentrated work in the early morning, and then I was off. After loading up the truck with food and drink, we were on our way to the beach. On my way out the door, I grabbed a new knitting project that was ready and waiting. We had a lovely afternoon hanging out, chatting, laughing, eating. With teenagers there is always eating. Life with temperamental teens can be trying, but yesterday renewed my sense of hope in the whole growing up process. The breeze was a bit stiff at times and the water temp was brisk, but that didn't bother me. I had time to knit a few rounds. Woodstacking Cowl in Oma's Organic, Byzantium. 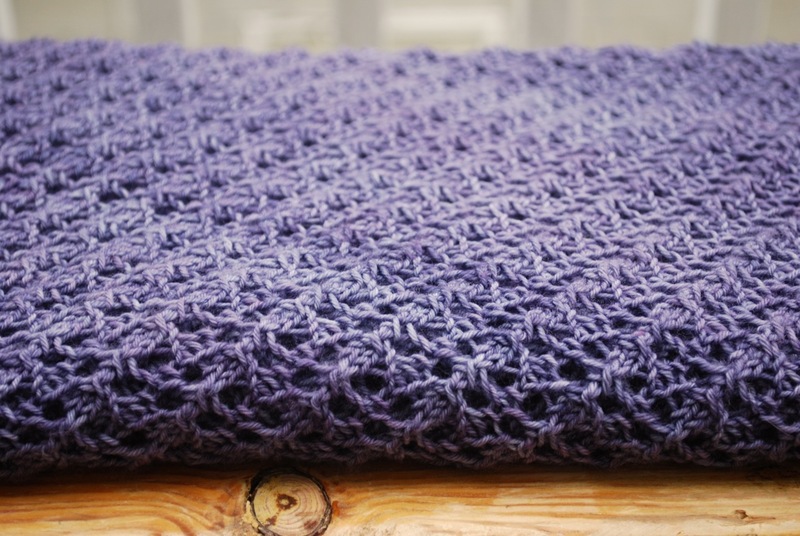 This cowl is an effortless project . . . perfect for a day at the beach or any getaway day. I found this week's color inspiration hidden in the grass, not far from the beach. Shades of blue and gray with stripes for a bonus. I had a meeting yesterday, a casual monthly gathering that has "knitting time" written all over it. It was the perfect opportunity to start a new sock project and so I did. 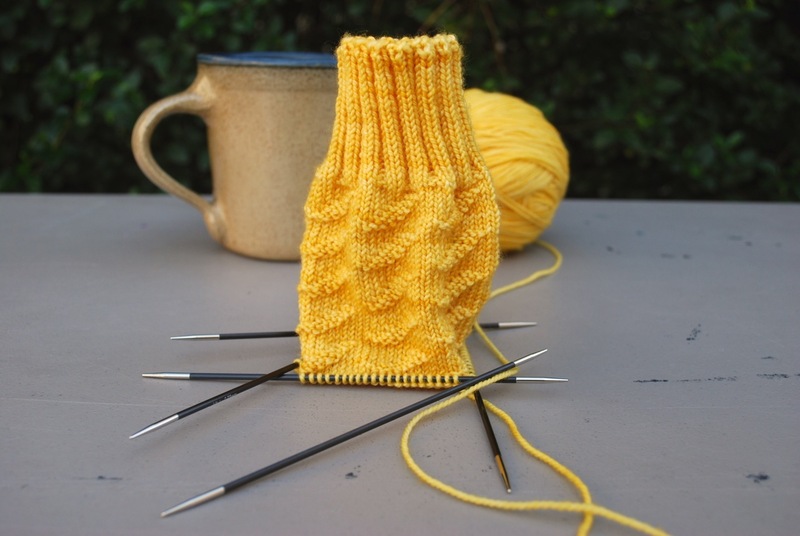 Caterpillar Sock by Anne Hanson. Little purl bumps around and around create caterpillars. I'm mesmerized. This sock was the first thing I thought of when I woke up this morning. I think my to-do list can wait a while. Sometimes it takes a little nudge to get things rolling. 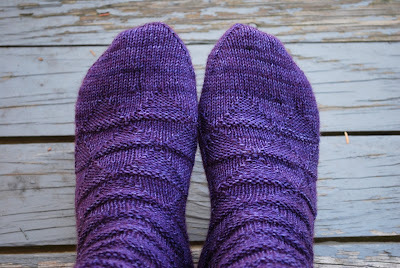 The slight, cooler shift in the weather is a good reminder that summer won't last forever and that I need more handknit socks. 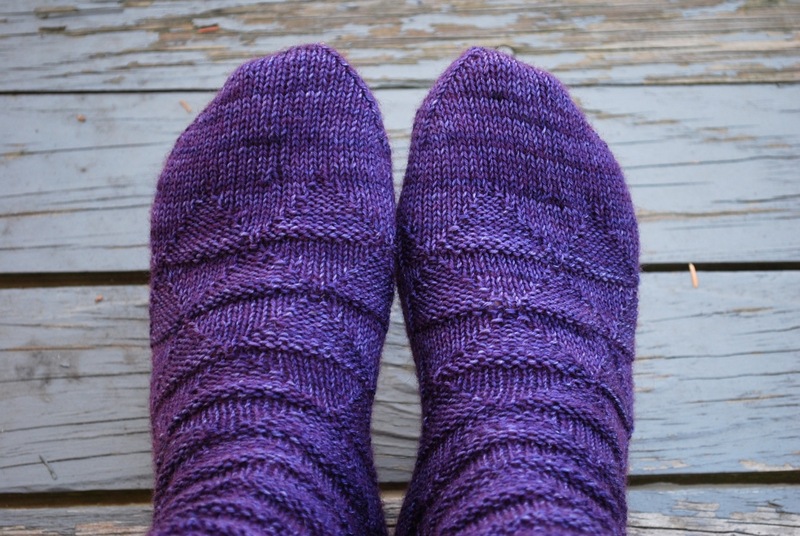 After just a bit of focused knitting time, I released this purple pair into the wild. Luxor made with Paula Violet. Paula is 100% Superwash Blue Faced Leicester and has always been one of my favorites. 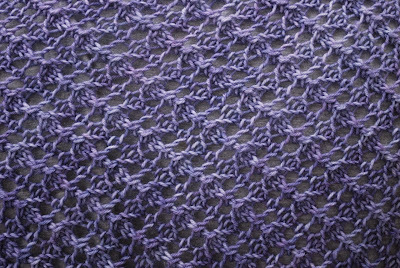 It's a hardwearing yarn with a subtle shimmer. 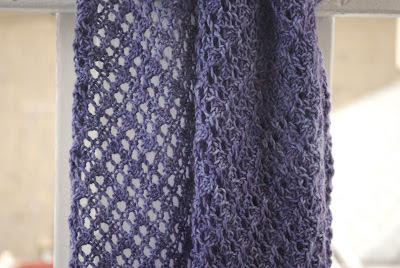 This pattern is a fun knit and comes in several sizes. The rounds of knit and purl combinations create a split diamond design. There's just enough variety to make it interesting. The textured fabric is cushy, elastic and comfortable. And now I have to deal with this. Empty needles that need a new project. Not a bad way to start the week. At the beginning of the week I had penciled in a beach day for Thursday. When Thursday rolled around and I awoke to the gentle sound of rain, I knew I had to shift gears. 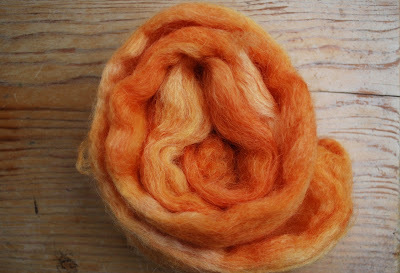 Unscheduled dye days can be full of inspiration. 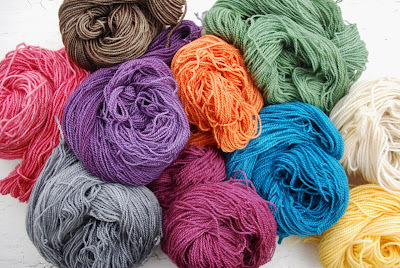 It's time to restock my fiber inventory. I discovered this dragonfly in my driveway. 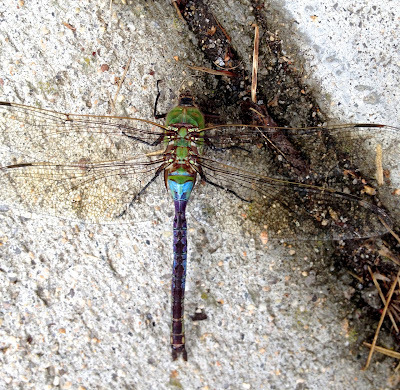 It lingered for just a moment. My color inspiration for the week. Colorful array from top to bottom. I've been rotating back and forth between two knitting projects. Socks, shawl, socks, shawl. While I'm making great progress on the socks, I'm not so sure about the shawl. The section I'm working on has to measure 58 inches. I know I'm not at 58 inches, but I'm afraid to measure it for fear that I've added only 2 inches since the last time I measured. All those rows for only 2 inches . . . I couldn't bear it. So I keep knitting row after row, hoping to climb out of the hole and get to the other side and something close to 58 inches. At this point, it's better to keep my head down and keep knitting until I can summon the courage to pull out the tape measure. While I've been bouncing back and forth between these two projects, my mind has wandered to a little skein that's been hanging out at my desk. It's been waiting patiently for a long time. I'm holding off, but I'm very tempted to introduce a new project to the rotation. Sometimes adding to the mix can be a good thing. Just a little something. Maybe after I rack up a few more inches. And yes, I do realize that all these projects are shades of purple . . . the same, yet very different. Stitch by stitch, row by row. A little bit here, a little bit there. 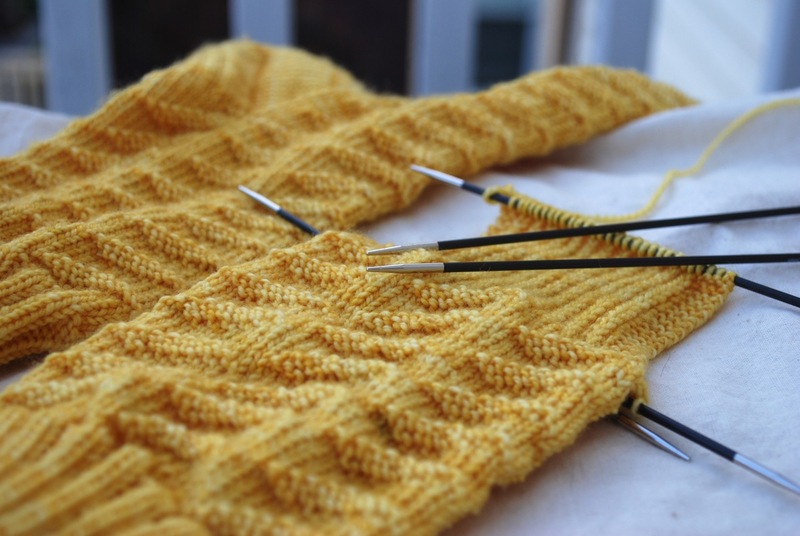 You don't need a marathon knitting session to see forward progress. Sometimes I have to grab my knitting time in bits and pieces. It was a busy weekend for dyeing. 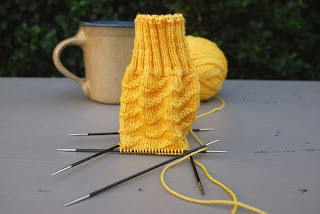 I'll spare you the debate I had with myself over the merits of starting a new knitting project. In the end, the work in progress won out. 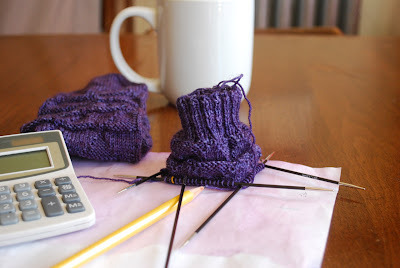 Whenever I sat down to crunch a few numbers, I also knit a few rows on my current sock project. And it paid off. I finished the first sock and have a healthy start on the second. In case you're interested, this is Luxor in Paula Violet. 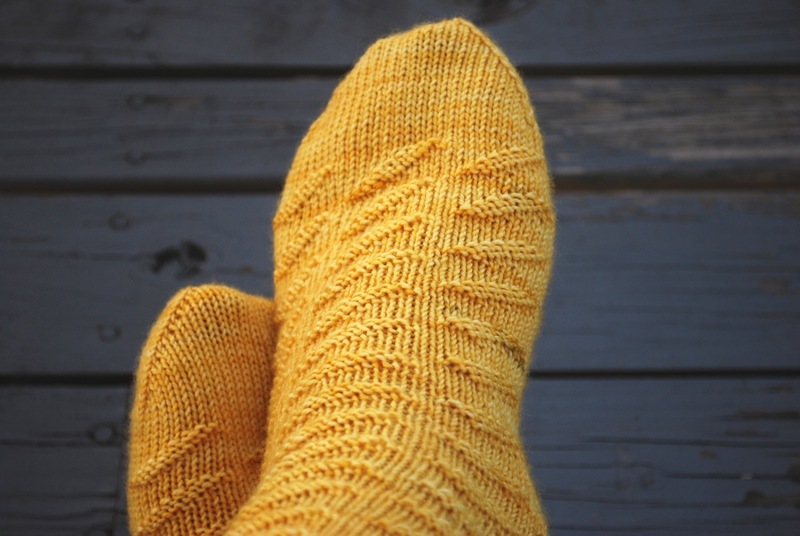 This design calls for a short row heel. Normally I prefer a heel flap but decided to go with the flow on this one. I've been exploring different short row techniques for a while now. 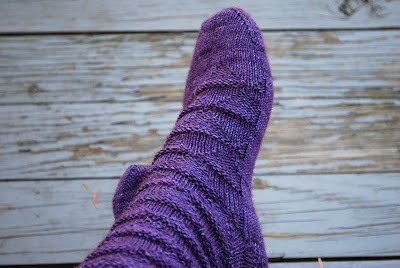 My current favorite is the German short row, but I thought this sock would be a good test for the shadow wrap method. I'm not going to reinvent the wheel - follow the link for detailed instructions. 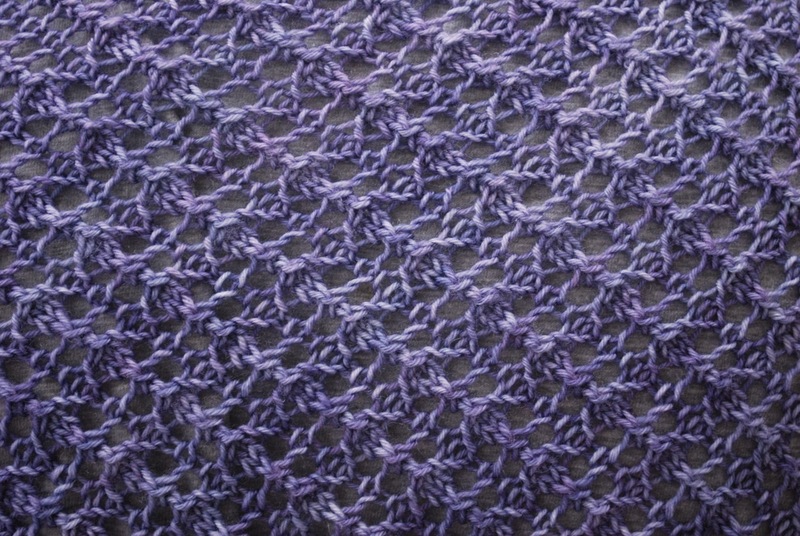 The shadow wrap method is a good exercise in stitch anatomy, and it works like a charm. It's always nice to have another technique in your toolbox. 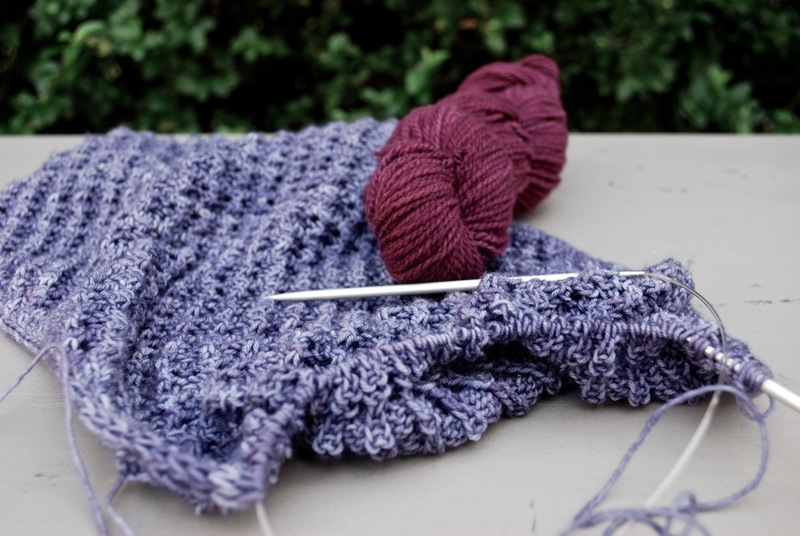 Give it a whirl if you're working with short rows. When I'm out and about at shows and events, people will look at the array of colors in my booth and ask what my favorite color is. To be honest I don't have a favorite color. I treat my colors the way parents treat their children. Most often parents try to be fair across the board without favoritism. I try to treat the colors the same way - they all get equal billing. I learned a long time ago that even the most off the beaten path colorway will be appreciated by someone. Probably one of the most underrepresented colors is yellow. I know generally yellow doesn't sell as well as many of the others, but that doesn't mean it shouldn't be available. 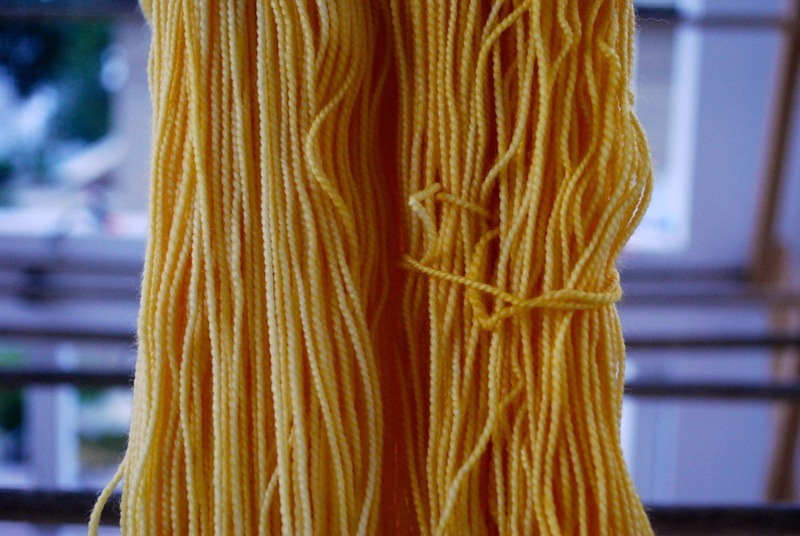 The other day I took a break from the dye schedule and was tinkering with some yellow combinations. These yellow ideas had been simmering for a while, so it was fun to put the wheels in motion. At the end of the day I had settled on this one - a warm, mellow shade. Maybe it will travel with me this fall. And since I'm on the subject of yellow, I had to include it in my color inspiration for the week.